¿Que es lo primero que se le viene a la cabeza cuando piensan en statement pieces? Para mi significa piezas que no necesitan mucho styling porque sus diseños ya son increíblemente únicos y llamativos que completarlo con algo simple es más que suficiente. Creo que una de las claves de poder crear looks interesantes es definitivamente invertir en statement pieces que puedas usar de distintas maneras. Fame and Partners es una de las pocas marcas donde encuentro statement pieces modernos, imprescindibles, hechos a la medida, súper adaptables a tu cuerpo y nunca producido en masa. Desde que descubrí su Anti Fast Fashion Shop cada pieza me queda a la perfección. Fue el año pasado cuando descubrí esta marca y todavía no para de sorprenderme con sus lindos diseños. Tienen una gran variedad de diseños súper clásicos, funky, divertidos y playful tanto en telas lisas o en prints. The Kling Top: Un top de volantes como este es un super statement piece y divertido de usar. En mi caso lo use con esta falda en corte A en color crema. Sentí que un bottom súper simple era suficiente ya que el top ya es bastante llamativo. Sin duda lo usaría también con unos jeans, o inclusive hasta con un bottom más formal. Sin duda me veo usando este top también como una boda en la playa o algún paraíso tropical. The Zhang Skirt: Siempre me ha encantado vestir faldas ya sea lisas o con print ya que me hacen sentir súper femenina. Cuando trabaja en RL recuerdo que las usaba bastante. Mi único problema de comprar faldas es el largo ya que a veces son muy largas que ni aunque use tacones siempre las termino arrastrando al piso. Por eso me encanta buscar faldas en Fame and Partners ya que el largo nunca es un problema para mí porque me queda a la medida para usarla con flats sin tener que arrastrarla al piso. Me encanta usarlas en mis viajes por que puedo verme chic y cómoda. Esta la combine con una chaqueta de jeans para un look casual en la playa cuando es un clima más freco, pero fácil la veo con una chaqueta negra de cuero también para un look más de ciudad y más chic. ¿Cuáles de estos statement pieces son tus favoritos? Gracias por leer y que tengan una linda semana por delante! You look so beautiful my darling. All these pieces are made for you… very effortless and stylish at the same time. What else can I girl wish for from the fashion world. As always, your pictures are so colorful and full of positive vibes. I love these modern pieces from Fame and Partners. I’ve checked their site and fell in love with their collection!! I love all of your statement pieces! I am a huge fan of Fame and Partners! I love that they are made to order, so they don’t waste resources and material. I recently purchase a jumpsuit from them and I am OBSESSED! I also customized it to have a corset detail in the front. I also really love the purple skirt you are wearing! Beautiful! I couldn’t agree more, whenever I think of statement pieces I like to think of garments that are just basic and every woman should have in their closet because they are super simple to style to make them work for really any occasion. I can’t even begin to express how much I love that first outfit. I swear when I first saw the cover of this blog post I was already super thrilled to check it out. You look like a stylish ballerina, haha. That white top with the gorgeous ruffle details really stands out and looks amazing with that skirt. You look so stunning babe! I LOVE this post! I was introduced to Fame and Parters earlier this year and they’ve become by favorite go-to. Everything is so feminine and timeless, yet totally edgy and cool. Absolutely love that little white dress – you could even wear it in the winter with a black leather moto and boots! Thanks for the cute post, and for spreading the word on F+P. We are both serious FAME AND PARTNERS fans! I love them! Love not only their amazing customizable designs with top notch quality, but what they stand for as well! Really an amazing company all around! I would never have guessed that the Kling Top was a top. the cut of it makes it seem like it’s attached to your skirt. I find that to be so appealing because it looks seamless and that really opens up the styling options. Like you said, pairing it with a pair of denim would be perfect too! It’s definitely my favorite! Love the drama of the ruffle on that top – but the print is gorgeous on the skirt! Both great pieces – and I love that you can customize! I also typically avoid maxis because they always drag on the floor – how perfect that these are custom made to your height! I’m going to check out Fame and Partners right now! I have never heard of them before but after this i definitely ned to check them out! I love how versatile you can be with that top, it can be a fun flirty day top or a elegant night top! Even though the prices are on the higher side they are definitely worth it! I really love statement pieces for their unique design and the “high fashion” feeling. Can’t agree with you more – it is a great idea to invest in statement pieces in order to diversify a wardrobe. I love both outfits, but the Kling Top is such a dream! Out of all the pieces, I think that Zhang skirt is my absolute fave. I would definitely style mine exactly the way you did, with a white blouse and a denim jacket. I have to check out Fame and Partners now! Your white ruffle top is so cute! I love how these pieces make a statement but aren’t overwhelming. Also, your the pattern on your skirt is so fun. 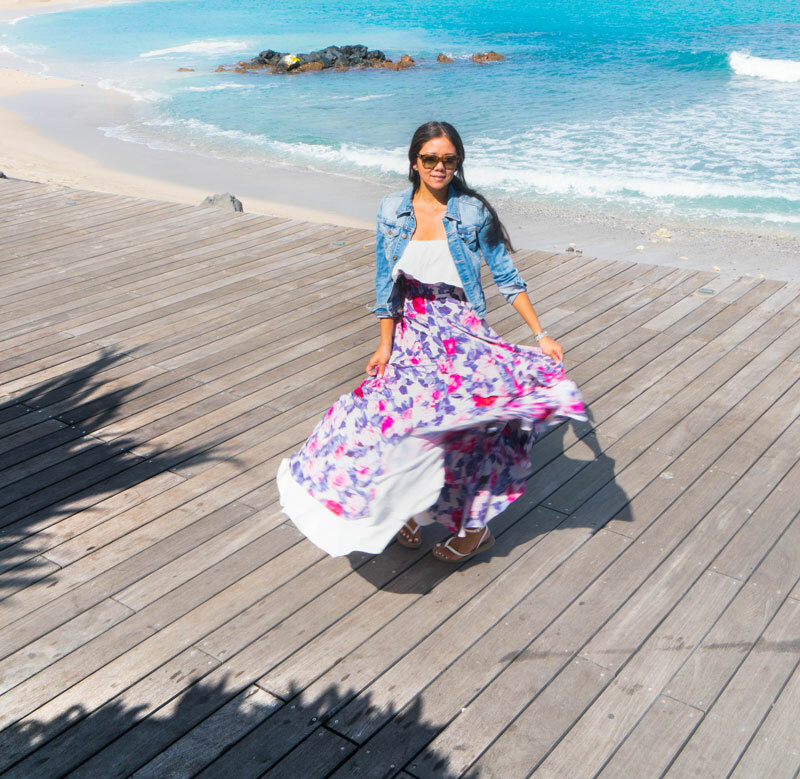 I love long flowy skirts because they are flattering and super feminine. Fame and Partners seems to have really cute clothes, so I will definitely have to check out their website! Girl, I have exactly the same top and I really love it. I think this particular top has become a number 1 for all the fashionistas this season, haha! Not mentioning it looks divine, it is also very well-made and incredibly statement. Unfortunately, I didn’t have an opportunity to buy a zhang skirt for this season, but it looks stunning indeed. I’ve never heard of this Fame and Partners brand before, but I will definitely take a look! All of these outfits are absolutely stunning! 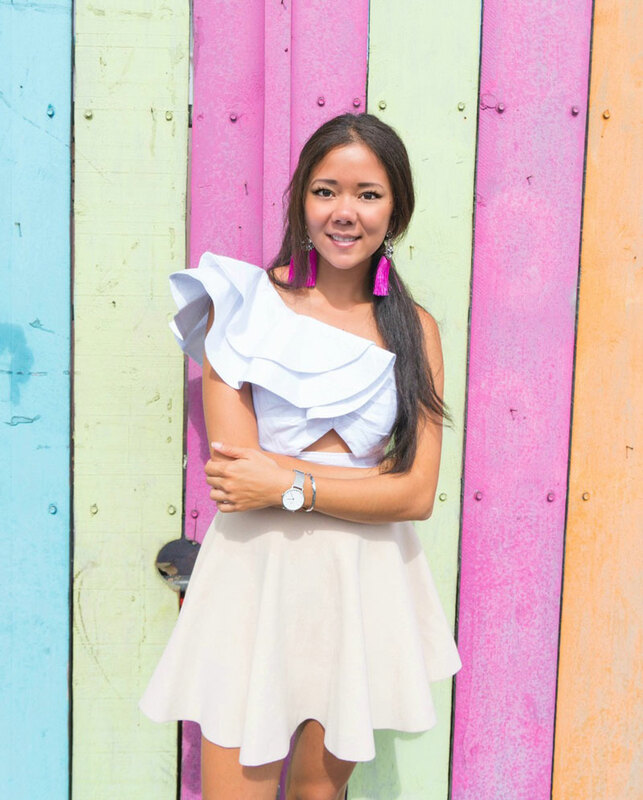 The ruffle top is probably my favorite – a simple yet stand-out piece that can look good with anything! I love statement pieces! They make dressing up so easy because all I have to do is throw it on along with some basics and I feel like a million bucks! 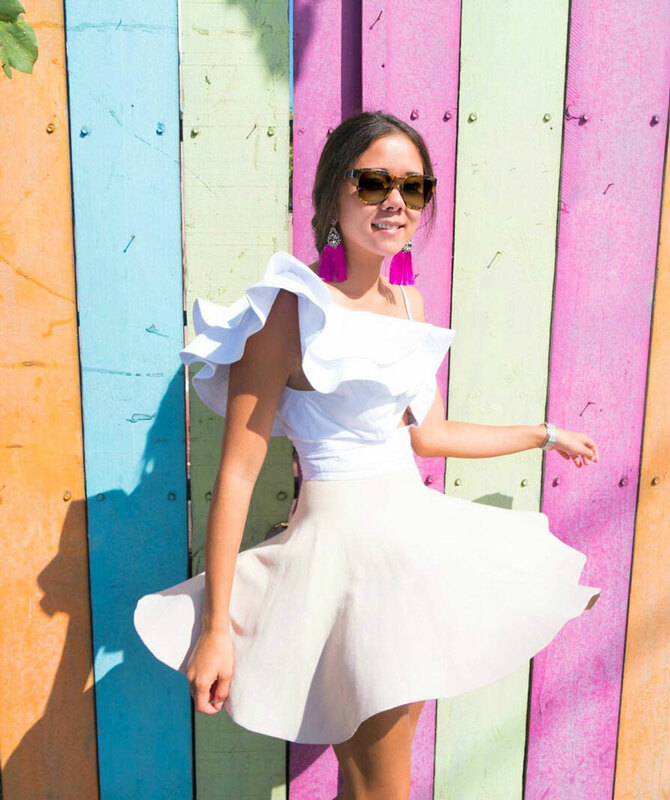 I’m so obsessed with your ruffle top! Love the way you styled it. It looks so pretty with your skirt.